A countryside walk and a pub lunch. The perfect combination. Ahhh, the glorious British Great Outdoors, beckoning us out to walk whenever we can - and it’s true to say that the Meon Valley countryside’s never looked better. Home of the Bakers Arms, the picturesque, Meon Valley village of Droxford is nestled amongst some seriously lovely countryside and it’s neighbour to some of Hampshire’s prettiest villages. The Wayfarers Walk passes through Droxford (if you own a pair of walking boots, you’ll have heard of it) as does the River Meon which, during the summertime, offers a host of paddling, fish spotting and photo-taking opportunities. When life’s busy it’s easy to forget that there are some great places to escape to right on our doorsteps and a good dose of nostalgia and fresh air works wonders for the soul - as well as the stress levels. With this in mind, we’ve hunted out a couple of nice, leisurely local walks, just in case you find yourself at a loose end this weekend. It goes without saying that a good walk is a sure route to a big appetite, so picking a great pub to start from, finish at or pass by has got to be a top priority when it comes to route planning. Combine the delights of the Droxford countryside and the brilliant Bakers Arms menu and it’s fair to say you’ve got a match made in heaven. Our first walk is a classic Droxford walk, details of which can be found on the excellent Hampshire Life website here. It’s a 4.5 mile round trip with a little bit of uphill action and a sprinkling of stiles. Should take an hour and a half or so, depending on the length of your legs. You head South from Droxford (park up in the car park by the church) then head cross country, via fields, stiles and a kissing gate (kissing optional) to Soberton. Then it’s a case of heading north, along the east side of the Meon Valley before crossing over the river again and back to Droxford, where the Bakers Arms team will be ready to receive you with well deserved sustenance. A little bit longer, but definitely just as lovely is a walk from 'bikesandboots.com.' which you can find here. They say it’s about 8 miles so you might want to take a hip flask. You head along Hacketts Lane from Droxford village and follow the Wayfarer’s Way for a while, then it’s a field trek to Corhampton Forest. 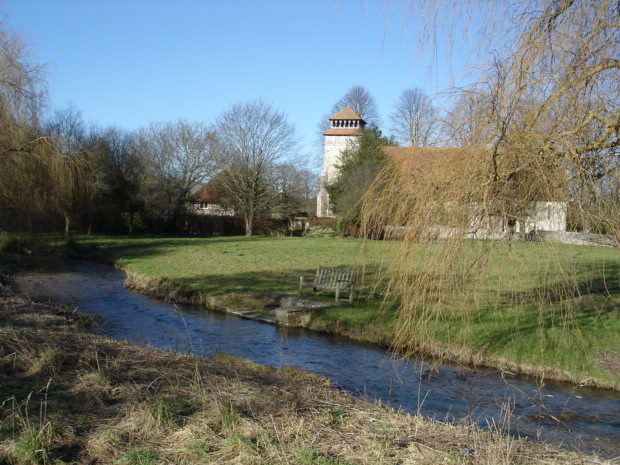 Next you walk through Meonstoke, meander along the river and then back to Droxford via the old mill and the church. By the time you get back to the car park you’ll definitely be in need of refreshment, relaxation and a pat on the back. Cue a few steps more to the Bakers Arms back door… And relax. Alternatively, if you just want a short pre-lunch meander with the little ones, you can head to the Droxford church, have a wander around there and then head down to the river where there’s potential for paddling or pooh sticks. You can follow the paths a little further if you fancy it, or hang a left towards the old mill, and then back round onto the main High Street before it's back to the Bakers Arms for lunch. There’s a bit more information on walking around the Droxford/Bakers Arms area to be found here and here and there's a good map showing paths here. We’d love to welcome you for a post-walk lunch or dinner at the Bakers Arms pub sometime soon. You can book in advance and once you've built up an appetite you can refuel with a light lunch, slap-up three course meal or our award winning Sunday Lunch, washed down with a glass of something refreshing. Children are always very welcome (there’s plenty on the menu to suit discerning eaters) and we’ll always find a space and a water bowl for your furry, four legged friends too (though if they’re very muddy, we might hand you a towel first). Give us a call on 01489 877533 to make a booking. Happy walking. NB. The picture of the church is from bikesandboots.com and the picture of the river and bridge is from hampshire-life.co.uk, both work a browse if you're looking for good pubs and nice walks.